Tomorrow night our home will be filled with Stony Brook students eating food, talking with friends, playing the piano, roasting marshmallows, and hopefully having a good time. Every weekend at “The Brook” at least one Open House occurs whether it is in a dorm or in a faculty member’s home. Last year we hosted two Open Houses—one in January and one in May. This year we are only slated for one. I received some good advice before we hosted our first Open House last year, which was to keep the food simple. No making mini pizzas or creating your own subs—just a few choices of standard snack food (in large amounts) and lots of drinks .The School gives each faculty member some money to cover the cost of the food, which is much appreciated. I shouldn’t have been surprised that except for some stray pretzels and a few hot chocolate packets, the students ate everything. We were also told that students tend to come right at the beginning to grab some food and then they leave, moving onto the next activity. We did have a rush of students at 8 pm, but they didn’t leave. I would like to think this was because they liked the atmosphere or the games that Brad organized or they thought the Brummelers were pretty cool. Who knows why they really stayed, but at least 75 of them were crammed into our house last January and about the same number last spring. I couldn’t resist taking this picture at our January Open House. 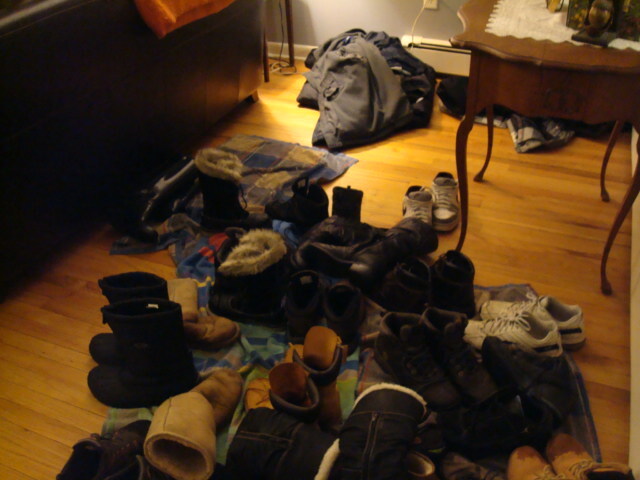 Both the front and back doors had piles of shoes scattered around them. Before I paint too rosy of a picture of Open Houses and hospitality, let me also say that this event wipes me out. From the time the first student arrives, to turning off the porch lights, I am constantly on the move, refilling chip bowls, putting out more brownies, throwing away empty 2-liter bottles, wiping up spilled soda, and emptying the over-flowing trash can multiple times. It is exhausting. And the day after an Open House is work as well as I rearrange my house and find all the stray cups and pick up the bits of crushed potato chips off the floor. This isn’t the picture of hospitality found in the pages of Better Homes and Gardens or Martha Stewart Living. I worry about my furniture and my favorite decorations being ruined probably a little too much and I certainly don’t like wiping greasy fingerprints off my walls. Yet, if I look at examples of hospitality found in Scripture, I am fairly certain it looks more like my Open House than a party at Ina Garten’s house. This is NOT a slam on Ina Garten. If you know me at all, you know I am one of her biggest fans, and I think she knows a thing or two about hospitality. My point is, practicing hospitality is sometimes messy and a little out-of-control. Some of the students who walk through my door have prickly personalities, and if it wasn’t for the Open House I wouldn’t want to invite them to my home. It is not always a three-course dinner with friends around a beautifully decorated table. Practicing hospitality sometimes costs a great deal—emotionally, physically, and financially. As I prepare for the onslaught tomorrow night, two comments from two different students have stuck with me from last year. I mentioned earlier that one of our Open Houses was last May. It was a lovely spring night so we planned to have the food table set up outside (less mess inside!) and also have a fire in the fire pit. As a way to provide some extra light and to dress up the table, I arranged a string of Christmas lights down the table and around the food. Nothing fancy, just a string of Christmas lights. From the “oohs” and “ahhs” of the students you would have thought I carved an ice sculpture. One student said, “You made it look so nice!” In spite of what you may think about high school students and their powers of observation, I was reminded that they do notice details. Another student, who I am sure, lives in a bigger, newer home, which probably has more up-to-date features than ours, kept telling me, “I just love your house!” My home will never grace the pages of a decorating magazine, and that’s okay. I like my house and the way it is decorated. I think it reflects a cozy, welcoming style. I hope it was that cozy, welcoming sense that resonated with the student and prompted her to respond the way she did. The weather forecast for tomorrow looks promising. We’ll have the food table outside again and a fire in the fire pit. When the clock turns eight tomorrow night, I hope each student who walks through my door will feel welcomed—even if they spill soda on my wood floor. One more thought: Margie Haack, co-founder of Ransom Fellowship, writes a blog called “Toad Drinks Coffee.” If you want to read more about hospitality that is welcoming and unpretentious, check out Margie’s blog. Written in a winsome style, which communicates her deep love of God, you will wish you could sit at her table and share a meal with her. She also writes about hospitality in her newsletter Notes from Toad Hall. You can check out Ransom’s website (http://www.ransomfellowship.org/) for more information about the ministry and how to get on their mailing list. Your blog has helped me put things in perspective again. I have no doubt that your home has been a blessing to more than a few Stonybrook students! I miss you my friend. Thanks, Janelle, for your kind words. I think you need to plan a trip to Long Island! The next time your hubby has business in NYC come along for the ride. The LIRR is right across the street from the school, making it easy to take the train.